As a child I had this huge fascination for colours. More than drawing or sketching I would spend most part of my leisure time filling colours in awkwardly drawn sketches - red, orange, green, navy blue - varied shades denoting different moods. Once my paintings were complete, my teachers would marvel at the delightful creations. But these would never be honored as 'the best' or 'the most beautiful painting' of the class. At best these would be grudgingly bestowed the discriminatory tag of the 'most brightly coloured sketch'. This discrimination or lack of honour, whatever it might be called, rankled a deep woe within my bosom and often when alone and idle I would while many moments pondering, rather, brooding over this which for me was almost a personal deprivation. As I grew up my external manifestation corroborated the fact that I had gained age but the heart within remained that of a desolate, deprived child. By and by more pressing matters took up my attention. Nevertheless, the lament of a child's heart found expression in family gatherings and get-togethers wherein I would willy-nilly broach the subject and cry over spilt milk. The unfulfilled dreams of yore would be raked up without any conscious or coercive efforts but once intruding my thoughts would trouble me very much for a long, long time. Consequently, my peers, colleagues, friends and relatives came to know about my unfulfilled childhood dreams sooner or later (as I did speak about these quite often), but however did not take them seriously, treating these in passing as one of those mundane remembrances of the past which middle aged spinsters like me were fond of repeating as loud musings. Except my nephew who took my reminiscences so seriously that I was a little taken aback by his reaction. He was now a burly young fellow of twenty and six working and almost settled in Bangalore. He came especially to be with me on my forty fifth birthday. We had a lovely time together. Before retiring to bed, he pulled out a slender, longish box made of bamboo on which were crafted intricate designs and presented to me as my birthday gift. I was naturally touched. 'Open it,' He said enthusiastically. I did so and to my utter surprise and delight, lay reposed inside an equally exquisite piece of craftsmanship - a quill of sorts with a long, sleek handle fringed on one end with soft, feathery bristles. It was also made up of bamboo with the handle boasting of beautifully carved hieroglyphics. 'Winged Touch' it' called,' Chimed my nephew. 'The shop owner told me,' He replied. 'It's a paint brush,' I said unnecessarily but with such awe in my speech that my nephew smiled. I laid it down on my bed side table, my fingers itching hard to hold and blow it on virgin pages of my old sketch book, still preserved in one of the dusty corners of my book case. But it was only after my nephew departed that I could make time for my favourite childhood past time. page just at random. Now the question was what to draw? As I was uncomfortable with the pencil between my thumb and forefinger, I decided to draw with the brush itself. There was a box of water colours too fortunately tucked in one of the drawers of my study table. Thanks to my magpie like hoarding habits. As the brush lightly touched the page, a sigh deep as the ocean escaped me emptying my soul. What bliss it was to feel the exquisite quill in my hand. Sitting in front of the window, there was no dearth of objects of beauty, as I looked up. My flat fronted a small park. Although unkempt it had its own wild beauty. Nature took care of that. Amidst the rows of green had grown on its own a pair of blushing bottle brushes softly swinging in the light breeze that blew and winking impishly at me as if challenging me to imprison their vibrant visage in the pages of my drawing book. I tried and failed miserably. My hands shook. The lines were as crooked as ever. Years of lack of practice made it worse. My throat choked. A few drops of tears glistened in my eyes. I dropped the brush on the opened page and left the room hurriedly to return late next morning. As I entered the room, my eyes fell on the open drawing book and the brush reclining on it. A wave of bottled grief tossed and turned inside me to burst forth. I neared the table to close the book and put back the brush in its box. It was futile to dream of something which was God's gift to the fortunate few and I being His step child it was better not to even think of it. But 'but' What was this? As my hands extended to close the book, my eyes fell on a pair of bright pink bottle brushes smiling at me shyly from the pages of the drawing book. I was speechless. When did this happen? 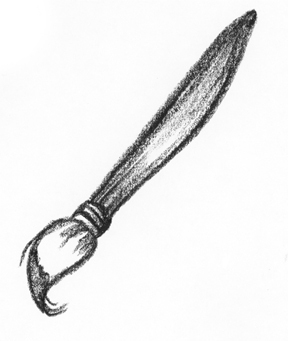 Was the brush capable of drawing and colouring by itself taking a cue from the holder's heart, i.e. in this case mine? I was completely at a loss for words. What did my nephew say was the name of the brush? 'Winged Touch?'. A magic Brush? In school I had read a story that a poor boy once found a magic brush which could paint on its own converting the painted objects to reality. But the only difference here being the desired object was getting flawlessly drawn and coloured in the drawing book. For me that was dream come true enough. Did that mean there were magic brushes in this world which could turn our dreams to reality? My elation knew no bound. But shhh!.I'd keep this as my bosom secret and not tell any body even to the closest of my close ones lest the magic vanished. But I'd definitely surprise them with my brushes' creations one day. Of course, they'd be known as my own. Who'd know that they were not mine if I did not wish to tell them? The devil in me did meticulous planning while the angel went off to deep sleep. Did my nephew know about the secret power of the brush? I tried to find out by questioning him obliquely during one of our telecoms. He seemed oblivious to it. I was ecstatic. .......To be concluded in Part 2. Thanks Indi for sacrificing your sleep to go through my work. Thanks a lot. Good Night and Sleep Well. Tomorrow will be another day. I think your story has promise. There is a smooth flow of ideas from one to the next that adds relaxation to the reading and the language used isn't superlative or too complicated for the theme.